Notes: This article was first published in Catamount Tavern News & The Northeastern Anarchist in 2008. Gonna leave the city, got to get away. you know I sure can’t stay. The first wave of communards hit the Green Mountains in the mid-60s. By 1967 a number of communes were established, especially in the southeast part of the state. Of these, a good deal of their members cut their teeth in the Civil Rights Movement, and the continuing resistance to the war in Vietnam. One commune, Red Clover, was at the forefront of these new efforts. Members, including John Douglas, Jane Kramer, Robert Kramer, and Roz Payne, began as a radical media collective in New York City called Newsreel. 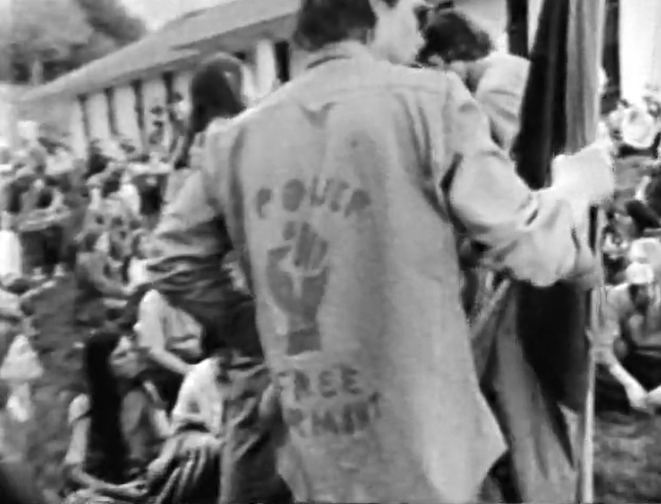 By 1969 this group, now transplanted to Putney, formed an organization called Free Vermont. The goal of Free Vermont was, simply put, to bring forth a popular revolution in the Green Mountains. To do so they worked to consolidate the newly arrived counter-cultural elements into the radical left. To a smaller extent, and with mixed results, they also sought to radicalize the native population. Free Vermont’s political analysis also hinged on the belief that the urban centers of the United States were teetering on revolt, especially in the Black community. In the event of widespread urban insurrection, it was their contention that Vermont, and other rural areas, should be prepared to act in a supporting role. Towards this end they acquired firearms as a means of self-defense. But the acquiring of weapons was by no account considered a strategic end by Free Vermont. They realized that to foster a meaningful and socialist revolution and/or to provide the anticipated broader revolution support, it was first necessary to build up their own effective institutions which in turn would give the counter-culture left a non-capitalist (or at least a more participatory) means of subsistence and production. By enlarge these new institutions took the form of producer, consumer, and service orientated co-ops and collectives. By bringing people together within co-ops it was hoped that the ingrained cultural posits of individualism and authoritarianism could be, in part, replaced with a new cooperativism compatible with the basic principles of socialism. Internally, a good number if not most communes sought to break the subtle and not so subtle chains of sexism. More often than not (and as a rule on Free Vermont Communes), decisions were made democratically, by all the members, housework was expected from males, while tasks such a splitting winter wood was also done by women. Childcare was collectivized and was performed by both sexes. Political meetings would include woman’s caucuses. The Liberation Garage in Brattleboro held free auto repair classes, organized by Jane Kramer, especially aimed at teaching women how to fix their cars and trucks. In Burlington the Green Mountain Red collective was pivotal in opening a free woman’s health clinic (which today is merged with the local Planned Parenthood). The Red Clover Collective organized a touring performance which taught and celebrated woman’s history. While Free Vermont sought to build equitable relations on the communes and a radical base of operations in the Green Mountains, it did not lose sight of its second purpose. As the local counter-culture became better organized, aid was offered to the urban revolutionary movement. In some instances children of Black Panthers from the eastern cities were sent north to attend the Red Paint collective school. Political aid was offered too. One former communard (who will remain unnamed) contends that the first dynamite procured by the Weather Underground Organization [an armed leftist group who carried out 27 bombings between 1969-1977 including those on the US Capital Building and the Pentagon] came from a granite quarry in Barre. John Douglas, for his part, states that Free Vermont helped establish safe houses for Weathermen and Black Panthers who went underground. They also facilitated clandestine border crossings into Quebec. But these activities were not committed without a price. Free Vermont communes were raided by the police and FBI. Government informants were known to be operating in many quarters. Douglas tells of a gathering he attended at the Franklin Commune (in far northern Vermont) where a group of federal agents posing as bikers offered to provide them with hand grenades and dynamite. Douglas declined. This surveillance and harassment ultimately lead to a pervasive atmosphere of paranoia and tension. In turn these pressures contributed to the eventual decline of the movement. Electorally Vermont, unlike most of the US, recognizes four major political parties. In addition to the Democrats and Republicans, there is also the very far left Liberty Union Party. This party, which received 5.7% of the vote for State Treasurer in 2006, was formed in the 70s as the electoral expression of the Commune Movement. Besides the Liberty Union, there is also the social-democratic oriented Vermont Progressive Party. The Progressives were formed by former Liberty Union member Bernie Sanders (now serving as the first socialist in the US Senate) and includes many activists and supporters from the commune days. Sanders won his first election in 1981, becoming the socialist mayor of Burlington. He formed the Progressive Coalition, the forerunner of the Progressive Party, shortly thereafter. His victory was a result not only of gaining the backing of key unions, but also of support work done by former communards. One such communard, Barbara Nolfy of the Franklin Commune, went on to serve in his administration as a member of a newly organized Burlington Woman’s Counsel. Furthermore, Progressive Party Chairman Anthony Pollina (who won 25% of the vote in the 2002 Lieutenant Governor’s race and is currently considering a run for Governor in 2008) was once an organizer with counter-culture allied NOFA. Presently the Progressives are the strongest third party in the nation, with six seats in the State Legislator (including the Chair of the House Agriculture Committee), the Mayorship of the largest city (Burlington, population: 39,000), several City Council positions, and countless Town Select Board seats as well as lesser elected posts. And again, our present seems to be witnessing a generational revival of cooperativism. In 2006, on the heels of greatly falling wholesale milk prices, the Dairy Farmers of Vermont (co-founded by Anthony Pollina) opened a farmer owned milk processing plant in Hardwick. More generally, of the forty worker-owned businesses in the state (which employ 2000 people), 10% are organized as democratic co-ops. From the Red House construction company in Burlington, to the Brattleboro Tech Collective, to the popular Langdon Street Café and Black Sheep bookstore in Montpelier, worker and farmer co-ops are again on the rise. This continuing trend to the left can even be observed in the declarations of the State’s General Assembly and other bodies of Vermonters who have gathered in capital building in Montpelier. Pressured from below, in 2007 the State Senate passed a resolution calling for the impeachment of President Bush, and both the House and Senate passed a resolution calling for a military withdrawal from Iraq. In 2003, the day the U.S. invaded Iraq, hundreds of Vermonters met in the State House where they unanimously passed resolutions condemning the acts of the Federal Government as illegal and immoral. And again in 2006 more than 200 Vermonters held a meeting in the State House to discuss the possibility of secession from the United States (a cause now supported by 13% of the population). Former communards and 60s-70s radicals were undoubtedly present at both events. All these declarations, as symbolic as they may be, point to the leftward trajectory of politics in Vermont; a trajectory which, in part, was set in course by the Commune Movement a generation before.